An in-depth report on the causes, diagnosis, treatment, and prevention of scoliosis. Scoliosis is an abnormal sideways curving of the spine. Everyone's spine naturally curves a bit. But people with scoliosis have a spine that curves laterally too much. Seen from the front or the back, the spine might look like the letter C or S.
Most of the time, the cause of scoliosis is unknown (idiopathic). Scoliosis can also be associated with congenital birth defects that cause a developing baby's spine to not form properly. Neuromuscular conditions are a third cause of scoliosis. These conditions include cerebral palsy, spinal bifida, and muscular dystrophy. Scoliosis affects both boys and girls, but girls are more at risk for curvature progression (worsening). Scoliosis is usually first noticed when children experience growth spurts, typically around the ages of 10 to 15 years. The health care provider will ask the child to bend over to examine the alignment of the spine and tilt of hips and shoulder. Imaging tests such as x-rays, MRIs, or CT scans may be performed. The degree of curvature is measured using a technique called the Cobb angle. Treatment for scoliosis depends on various factors, including the child's age, remaining skeletal growth, accompanying medical conditions, degree of curvature, and risk for progression (curve worsening). Scoliosis is an abnormal sideways curving of the spine. A normal spine has gentle natural curves that round the shoulders and make the lower back curve inward, but is straight when seen from the front or back. In scoliosis, the spine curves from side-to-side to varying degrees. Some of the spinal bones (vertebrae) may rotate slightly, making the hips or shoulders appear uneven. In severe scoliosis, the twisting in the spine can pull the rib cage into the rotation. Lateral curvature of the spine, scoliosis, is a relatively common condition. The majority of individuals with scoliosis do not require surgery or braces because their condition is self-limiting. Progressive scoliosis, however, requires therapy. The "S" shaped curve is usually more apparent on an X-ray. Scoliosis usually develops in the area between the upper back (the thoracic area) and lower back (lumbar area). It may also occur only in the upper or lower back. The severity of scoliosis is determined by the extent of the spinal curve and the angle of the trunk rotation. It is usually measured in degrees. 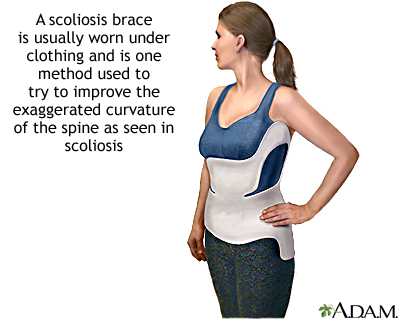 Curves of less than 20 degrees are considered mild and account for 80% of scoliosis cases. Curves that progress beyond 25 degrees need medical attention, usually involving periodic monitoring or bracing to make sure the condition is not becoming worse. (an exaggerated forward curving of the lower spine, also called swayback). 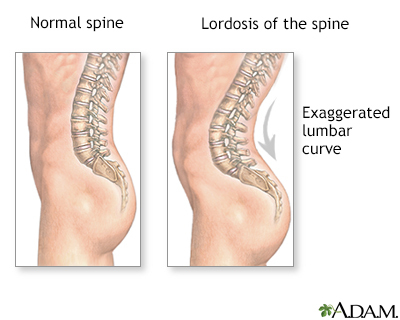 Lordosis is excessive curvature in the lumbar portion of the spine, which gives a swayback appearance. Cervical (C) vertebrae are the 7 spinal bones that support the neck. Thoracic (T) vertebrae are the 12 spinal bones that connect to the rib cage. Lumbar (L) vertebrae are the 5 lower and largest bones of the spinal column. Most of the body's weight and stress fall on the lumbar vertebrae. 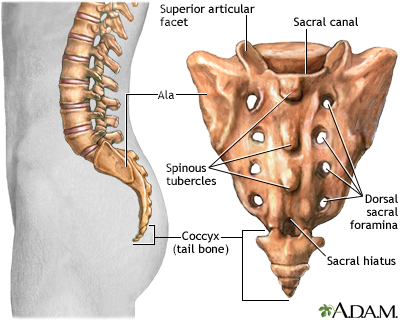 The sacrum is formed by the 5 fused sacral (S) vertebrae. The sacrum is a large triangular bone at the base of the spine that forms the back side of the pelvic cavity. The coccyx (or tailbone) is formed by the 3 to 5 fused coccygeal (Co) vertebrae. 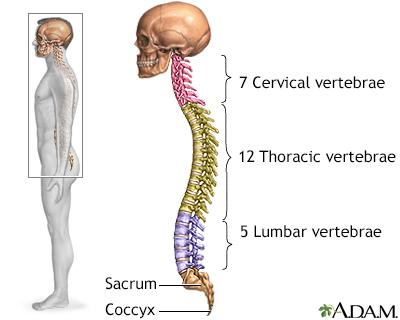 The coccyx is the final and lowest segment of the spine. Each vertebra is designated by a letter and a number. The letter reflects the region and the number signifies its location within that region. For example, C4 is the fourth vertebra down in the cervical region, and T8 is the eighth thoracic vertebra. 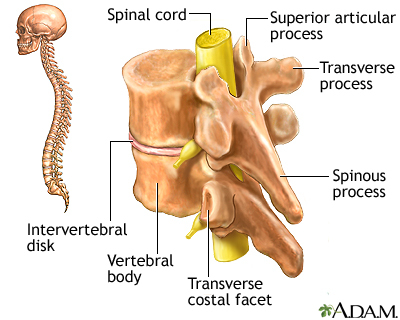 The vertebrae combine to form the spinal column. 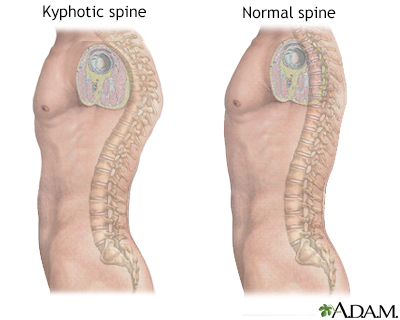 When viewed from the side, in the upper trunk the column normally has a gentle outward curve (kyphosis) while the lower back has a reverse inward curve (lordosis). Vertebrae in the spinal column are separated from each other by small cushions of cartilage known as intervertebral disks. Inside each disk is a jelly-like substance, which is surrounded by a tough, fibrous ring. This structure makes the disk both elastic and strong. The disks have no blood supply of their own, relying instead on nearby blood vessels to keep them nourished. Each vertebra in the spine has a number of bony projections, known as processes. The processes attach to the muscles and ligaments in the back and act like little levers, allowing the spine to twist or bend. Each vertebra and its processes surround and protect an arch-shaped central opening. These arches, aligned to run down the spine, form the spinal canal. 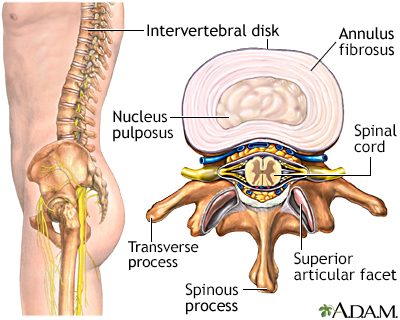 The spinal canal encloses the spinal cord, the central trunk of nerves that connects the brain with the rest of the body. A normal spine that appears curved. Possible causes include having legs that are different lengths, or having a temporary injury or infection of the spine. The curve will go away when the underlying problem is resolved. A fixed curve in the spine: Structural scoliosis may be due to idiopathic, congenital, or neuromuscular causes. In most cases, the cause of scoliosis is unknown (idiopathic). Because scoliosis often runs in families, researchers think that genetic factors may play a role. However, severity often varies widely among family members who have the condition, suggesting that other factors must be present. Infantile. Age 2 years and younger. Juvenile. 3 to 9 years old. Adolescent. 10 years and older. Idiopathic scoliosis is sometimes initially diagnosed in adults during evaluation for other back complaints or disorders. The curve may or may not be significant. Congenital scoliosis is caused by birth defects that affect spine formation or segmentation and result in deformed or fused vertebrae. Congenital scoliosis has a high likelihood of progressing in severity. Children usually require early surgical intervention to prevent serious complications. In addition to spinal problems, children with congenital scoliosis also have a higher risk for organ deformities that can affect heart, kidney, urinary, and nervous system function. Neuromuscular conditions can cause paralysis or weaken the muscles that support the spine. The curves caused by neuromuscular scoliosis are usually severe, and affect the entire length of the spine. This type of scoliosis is often accompanied by a condition called pelvic obliquity in which the pelvis is tilted to one side. People with neuromuscular scoliosis are at risk for significant complications, including lung and heart problems. Spina bifida is a congenital disorder (present at birth) in which the backbone and spinal canal do not close before birth. 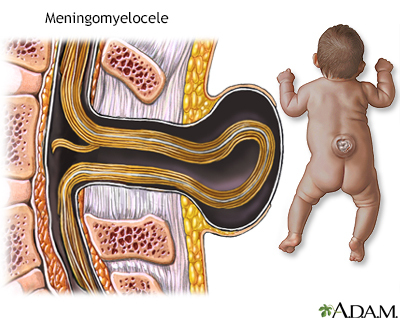 In severe cases, this can result in the spinal cord and its covering membranes protruding out of an affected infant's back. Spina bifida may be nearly inconsequential, or it may be repairable through surgery. Adult degenerative scoliosis, a condition that typically develops after age 50. This condition is due to disk degeneration, which is usually secondary to a primary condition such as osteoporosis (thinning bones) or arthritis. Adults with degenerative scoliosis may also develop kyphosis (hunched back). Scoliosis is usually first diagnosed in adolescence (age = 11 years), around the time children are experiencing growth spurts. Scoliosis affects both boys and girls. However, girls are more likely than boys to have juvenile and adolescent idiopathic scoliosis and to develop progression (worsening) of the curvature. Scoliosis often runs in families. Studies conducted in families with multiple affected members have confirmed the role of genes. Medical conditions and injuries that affect the spine, and certain types of genetic disorders, such as Marfan syndrome, can increase the risk for scoliosis. Girls are more likely than boys to have a progressive scoliosis. The magnitude of curve also plays a role in progression. One study found that a 20-degree curve is 70% less likely to progress than a 50-degree curve. Mild Scoliosis (10 to 25 degrees). Mild scoliosis is not severe, however it requires monitoring for possible progression. 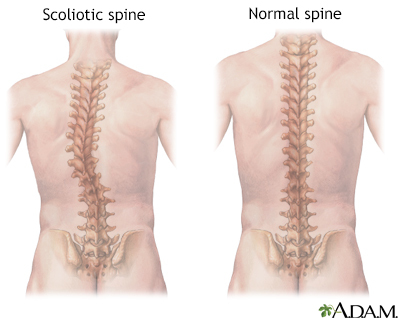 Moderate Scoliosis (26 to 40 degrees). Scoliosis with a curve over 30 degrees has risks for progressing into adulthood. It also poses risk for other health problems. Moderate scoliosis is usually treated with bracing.
. Scoliosis with a curve over 45 to 50 degrees nearly always progresses. It poses significant risks for health problems and reduced quality of life. If the curvature exceeds 70 degrees, the severe twisting of the spine can cause the ribs to press against the lungs, restricting breathing, and reducing oxygen levels. The distortions may also cause dangerous changes in the heart. Severe scoliosis requires surgical treatment. In general, the older the child the less likely it is that the curve will progress. 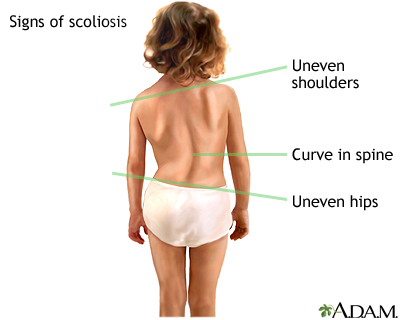 Scoliosis in a child under 10, for example, is more likely to progress than scoliosis in an adolescent. Girls have a higher risk for progression than boys. The location of the curve is also a factor. Thoracic curves (in the upper spine) are more likely to progress than thoracolumbar curves or lumbar curves (in the middle to lower spine). The higher the degree of curvature the more likely the chance of progression and the more likely the lungs and respiratory function will be affected. People with severe deformities, particularly those caused by underlying neuromuscular disorders, may develop restrictive thoracic disease. This term refers to breathing problems and trouble getting enough oxygen due to a deformity-related smaller chest cavity. Scoliosis is often painless and may not be noticed until a child reaches adolescence. It may appear in casual circumstances, such as a parent noticing that a hemline is uneven. 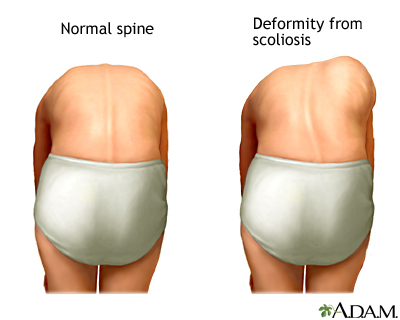 Most cases of scoliosis develop very gradually. Scoliosis may be suspected when one shoulder appears to be higher than the other, there is a curvature in the spine, or the pelvis appears to be tilted. With more advanced scoliosis, fatigue may occur after prolonged sitting or standing. Scoliosis caused by muscle spasms or growths on the spine can sometimes cause pain. Severe scoliosis caused by neuromuscular conditions may have symptoms associated with trouble breathing. To diagnose scoliosis, the health care provider will take a detailed medical history and conduct a physical examination. Imaging tests may also be used to provide additional information. The screening test used most often for diagnosing scoliosis is called the Adam's forward bend test. The child bends forward, dangling the arms, with the feet together and knees straight. The curve of structural scoliosis is more apparent when bending over. In a child with scoliosis, the provider may observe an imbalanced rib cage, with one side higher than the other, or other deformities. The forward bend test is used most often in schools and medical offices to screen for scoliosis. During the test, the child bends forward with the feet together and knees straight while dangling the arms. Any imbalances in the rib cage or other deformities along the back could be a sign of scoliosis. Walking on the toes, then the heels, and then jumping up and down on one foot. Such activities indicate leg strength and balance. Checking leg length and looking for tight tendons in the back of the leg, which may cause an uneven leg length or other back problems. Checking for neurological impairment by testing reflexes, nerve sensation, and muscle function. The child bends over, arms dangling and palms pressed together, until a curve can be observed in the upper back (thoracic area). The scoliometer is placed on the back and measures the apex (highest point) of the upper back curve. The child continues bending until the curve can be seen in the lower back (lumbar area). The apex of this curve is also measured. Measurements are repeated twice, with the child returning to a standing position between repetitions. If results show a deformity, imaging tests will be used to determine the extent of the problem. Imaging tests are used to provide further information on curvature. They include x-rays, and more advanced imaging tests such as magnetic resonance imaging (MRI) and computed tomography (CT). On an x-ray of the spine, the examiner draws two lines. One line extends out and up from the edge of the top vertebrae of the curve. The second line extends out and down from the bottom vertebrae. The examiner draws a perpendicular line to each of these two lines. The angle formed between the two perpendicular lines is the Cobb angle. Both factors are measured in degrees. These two factors are usually related. 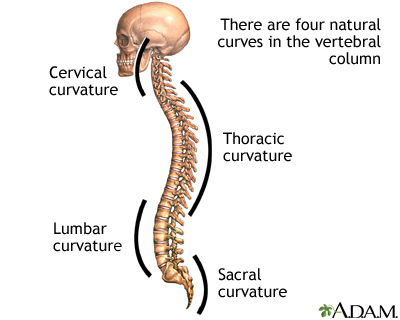 For example, a person with a spinal curve of 20 degrees will usually have an ATR of 5 degrees. However, most 20-degree curves do not get worse. People do not usually need medical treatment until the curve reaches between 20 and 30 degrees, and the ATR is 7 degrees. The general rule of thumb for treating scoliosis is to monitor and observe the condition if the curve is less than 20 degrees. Curves greater than 25 degrees, or those that progress by 10 degrees while being monitored, may require brace treatment. Children who have severe scoliosis and are at high risk for lung and heart problems may require immediate, aggressive treatment. Braces tend to be used in children ages 3 to adolescence, with curvatures between 25 to 40 degrees, who will still be growing significantly. Braces can help prevent worsening (progression) but do not correct the existing deformity. Surgery is suggested for children with curvatures over 50 degrees or when braces have failed. In adults, scoliosis rarely progresses beyond 40 degrees, but surgery may be required if the condition causes pain, neurological problems, or other symptoms that interfere with quality of life. The choice may not be so straightforward in certain cases, and it is important to discuss all options with your providers, including a doctor who specializes in orthopedics. Braces are usually prescribed to prevent further progression of curves that are at least 25 degrees, and no more than 40 degrees. There should be documented progression of the curve, and the child should still be growing. A brace is generally used until the child's spine stops growing. Braces are useful for idiopathic scoliosis. They are much less helpful for scoliosis caused by congenital or neuromuscular conditions. There is still uncertainty about which types of scoliosis curves are most likely to benefit from bracing. Braces must be worn for at least 13 hours daily for positive results. Depending on your child's condition, the doctor may recommend wearing the brace for up to 23 hours a day. Some types of braces can be easily removed to accommodate participation in sports activities. A brace is one type of treatment for scoliosis. The brace works by exerting pressure on the back and ribs to push the spine into a straighter position. The brace usually fits snugly around the torso and can come in many styles. Improvements in design have been made in recent years. In a child who is still growing, bracing is usually recommended to help slow the progression of the curve. Ideally, the brace is worn almost full-time until the bones have stopped growing. An orthopedic surgeon interprets the x-rays, assesses the potential scoliosis progression, and plans the treatment with the child and family. An orthotist measures and fits the child with the brace. A physical therapist may tailor an exercise program to the child. A nurse may also coordinate the treatment plans and provide guidance for physical and emotional support. The thoracolumbar-sacral orthosis (TLSO), also called the Boston brace, is custom molded from plastic. It comes up to beneath the underarms and can be fitted close to the skin so that it does not show beneath clothing. TLSOs are used to treat mid-back and lower curves. A full torso brace called the Milwaukee brace used to be the standard bracing treatment for scoliosis. It may still be used, particularly for high curves in the upper part of the back. The brace is made from rigid plastic and has a neck ring with a chin rest and pad for the back of the head. Two metal vertical bars attach the neck ring to the body of the brace. brace is designed as a body jacket, but lighter and more comfortable compared to the Milwakee brace. brace is another type of underarm brace. brace is worn only while sleeping. brace uses adjustable bands and a cotton vest that allows flexibility. It is a soft elastic brace that differs from other most other braces, which are rigid plastic. brace is another type of soft brace. In order for a brace to be effective, it needs to be worn regularly and for the prescribed hours. Children should have a brace that will be most effective for them, and have the lowest impact on their quality of life. Young people often refuse to wear braces, even the newer models. Emotional support from family and professionals is extremely important to help a child accept the process and stay compliant with the treatment. Physical therapy may be used along with bracing. A specific physical therapy approach called the Schroth method is designed specifically for people with scoliosis. It focuses improving posture, abdominal strength, flexibility, and breathing. Children whose skeletons have fully matured, and who have a curve greater than 50 degrees. Straighten the spine as much as possible by correcting the deformity. Balance the torso and pelvic areas. Stop progression of the curve and maintain the correction long term. Reduce pain symptoms and the risks for future heart and lung complications. Fusing (joining together) the vertebrae along the curve. Supporting these fused bones with instrumentation (steel rods, hooks, and other devices) attached to the spine. Different instruments, procedures, and surgical approaches are used to treat scoliosis. All of the operations require meticulous skill and should be performed by a surgeon specializing in spine surgery. The location of the curve (thoracic, thoracolumbar, or lumbar). Whether there are single, double, or triple curves, and the degree of rotation. The size of the curve. You should always ask the surgeon and hospital about their experience with the specific procedures being considered. Scoliosis surgery can take from 4 to 12 hours to perform. The child stays in the hospital for around 5 days, followed by 3 to 6 weeks of recovery time at home. Tell your child's surgeon what medicines your child is taking. This includes medicines, supplements, or herbs you bought without a prescription. Have a complete physical exam by the surgeon. Learn about the surgery and what to expect. Learn how to do special breathing exercises to help the lungs recover after surgery. Be taught special ways to do everyday things after surgery to protect the spine. This includes learning how to move properly, changing from one position to another, and sitting, standing, and walking. Your child will be told to use a "log-rolling" technique when getting out of bed. This means moving the entire body at once to avoid twisting the spine. The surgeon or nurse may talk with you about having your child store some of his or her blood about a month before the surgery. This is so that your child's own blood can be used if a transfusion is needed during surgery. If your child smokes, they need to stop. People who have spine fusion and keep smoking do not heal as well. Two weeks before surgery, the surgeon may ask you to stop giving your child medicines that make it harder for the blood to clot. These include aspirin, ibuprofen (Advil, Motrin), and naproxen (Aleve). Ask which medicines you should still give your child on the day of the surgery. Let the health care team know right away when your child has any cold, flu, fever, herpes breakout, or other illness before the surgery. You will likely be asked not to give your child anything to eat or drink 6 to 12 hours before the procedure. Give your child any medicines the doctor told you to give with a small sip of water. The provider will tell you when to arrive at the hospital. Be sure to arrive on time. The surgeon will make at least one surgical cut to get to your child's spine. This cut may be in your child's back, chest, or both places. The surgeon may also do the procedure using a special video camera. The surgeon reaches the spine by making a cut in the back. This is usually the standard approach. The surgeon makes a cut through the chest wall (called a thoracotomy), deflates a lung, and removes a rib. The rib may be used during the operation to support the spine, or it may be repositioned and later used for bone grafting during spinal fusion. The combination approach uses an anterior approach first, which allows better correction of the problems. The fusion part of the operation is done with the posterior approach. This method may correct large rigid curves and specific severe curves in the thoracic spine. This method uses a video-assisted anterior approach and specialized spinal instrumentation. The procedure is complicated and surgeons must be specially trained to perform it. It is generally reserved for specific types of curvatures. Children must wear a brace for 3 months following surgery. Most scoliosis operations involve fusing the vertebrae. The instruments and devices used to support the fusion vary. Before surgery, your child will receive general anesthesia. This will make your child unconscious and unable to feel pain during the operation. Raise flaps to expose the backs of the vertebrae that lie along the curve. Remove the bony outgrowths along the vertebrae that allow the spine to twist and bend. Lay matchstick-sized bone grafts vertically across the exposed surface of each vertebra so that they touch the adjoining vertebrae. Fold the flaps back to their original position, covering the bone grafts. These grafts will regenerate, grow into the bone, and fuse the vertebrae together. Bone grafts will help keep the spine in the correct position. Surgery for scoliosis involves correcting the curve (although not all the way) and fusing the bones in the curve together. A bone graft from the child's own hip, rib, spine, or other bone area in the body. Autografts work well, but because they require an additional incision and surgery, they cause more pain during the post-surgical recovery process. A bone taken from a cadaver. Allografts are usually from a bone bank. These types of grafts can sometimes increase the risk for infection. A graft made from biologically-manufactured human bone protein, may be another option. During surgery, the surgeon will use steel rods attached to the spine by hooks, screws, or wires to straighten your child's spine and support the bones of the spine. There are various types of instrumentation procedures. They include the Harrington procedure and the Texas-Scottish-Rite Hospital instrumentation procedure. The metal instruments are usually left in the body after the bone fuses together. In certain circumstances, a rod may need to be removed. Nerve injury causing muscle weakness or paralysis (very rare). Gallstones or pancreatitis (inflammation of the pancreas). Lung problems up to 1 week after surgery. Breathing may not return to normal until 1 to 2 months after surgery. Fusion does not heal. This can lead to a painful condition in which a false joint develops at the site. This condition is called pseudarthrosis. The parts of the spine that are fused can no longer move. This puts stress on other parts of the back. The extra stress can cause back pain and make the disks break down (disk degeneration). A metal hook placed in the spine may move a little. Or a metal rod may rub on a sensitive spot. Both can cause some pain. New spine problems may develop, especially in children who have surgery before their spine has stopped growing. Some children may later need a corrective procedure called revision or salvage surgery. This is usually performed to correct a failure of the previous procedure or address issues with disk degeneration or curvature progression at fusion site. Your child's spine should look much straighter after surgery. There will still be some curve. It takes at least 3 months for the spinal bones to fuse together well. It will take 1 to 2 years for them to fuse completely. Children can resume many physical activities in the weeks and months after surgery, but will need to wait until the spine is fully healed before participating in contact sports. Fusion stops growth in the spine. This is not usually a concern because most growth occurs in the long bones of the body, such as the leg bones. Children who have this surgery will probably gain height from both growth in the legs and from having a straighter spine. Your child will be given pain medication in the hospital and will be discharged with a prescription for pain medicines that can be taken for a few weeks. When prescription pain medication is stopped, the child can be given acetaminophen (Tylenol) to cope with pain. Nonsteroidal anti-inflammatory drugs (NSAIDs), such as ibuprofen (Advil), are not recommended because they may increase the risks for bleeding. The health care team will give instructions to the parents about how to lift and move the child. For some types of procedures, the child may need to temporarily wear a brace to help prevent rotating movements that could delay recovery. During the initial weeks of recovery, the child should avoid movements that involve bending, lifting, or twisting. Your child may need to see a physical therapist to receive an individualized exercise program that includes exercises for stretching and strengthening. An occupational therapist can provide exercises for activities of daily life, such as techniques for tying shoes, dressing, and bathing. Children can usually return to school about 1 month after spinal fusion surgery. This technique is used for very young children in whom bracing has not helped. 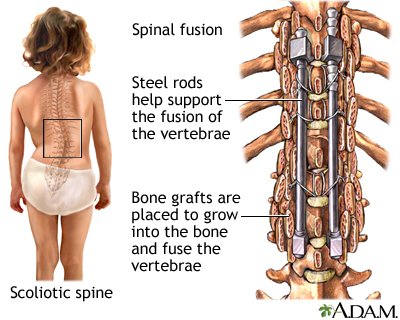 Instead of doing spinal fusion, a rod is surgically inserted into the child's back. The child will have surgery every 6 months to extend the rod so that the spine can continue to grow. Some growing rod techniques use a single rod, while others use 2 rods. Surgeons do these procedures using an anterior approach surgery without fusion. Vertebral body stapling is an experimental technique that may prevent curve progression in some young people with curves of less than 50 degrees. It involves stapling the outer curve on the side of the spine facing the chest, which helps stabilize and reduce progression of the inner curve. The procedure uses a special metal device that is clamp-shaped at body temperature. The device can be straightened when subjected to cold temperatures and inserted into the spine. When warmed up, the staple returns to its clamp shape and supports the spine. In most cases of adult scoliosis, nonsurgical care is preferred, if possible. This can include patient education, exercises, and medical treatments. Braces are not useful, and surgery is usually recommended only as a last resort. In general, pain is the most common reason for scoliosis surgery in adults. A procedure such as diskectomy (removal of a diseased disk) may be performed, followed by spinal fusion and instrumentation. However, adults have increased risks for complications of spinal fusion surgery. Bettany-Saltikov J, Weiss HR, Chockalingam N, et al. Surgical versus non-surgical interventions in people with adolescent idiopathic scoliosis. Cochrane Database Syst Rev. 2015;(4):CD010663. PMID: 25908428 www.ncbi.nlm.nih.gov/pubmed/25908428. Coillard C, Circo AB, Rivard CH. A prospective randomized study of the natural history of idiopathic scoliosis versus treatment with the SpineCor brace. Sosort Award 2011 winner. Eur J Phys Rehabil Med. 2014;50(5):479-487. PMID: 25251736 www.ncbi.nlm.nih.gov/pubmed/25251736. El-Hawary R, Chukwunyerenwa C. Update on evaluation and treatment of scoliosis. Pediatr Clin North Am. 2014;61(6):1223-1241. PMID: 25439021 www.ncbi.nlm.nih.gov/pubmed/25439021. Horne JP, Flannery R, Usman S. Adolescent idiopathic scoliosis: diagnosis and management. Am Fam Physician. 2014;89(3):193-198. PMID: 24506121 www.ncbi.nlm.nih.gov/pubmed/24506121. Hresko MT. Clinical practice. Idiopathic scoliosis in adolescents. N Engl J Med. 2013;368(9):834-841. PMID: 23445094 www.ncbi.nlm.nih.gov/pubmed/23445094. Katz DE, Herring JA, Browne RH, Kelly DM, Birch JG. Brace wear control of curve progression in adolescent idiopathic scoliosis. J Bone Joint Surg Am. 2010;92(6):1343-1352. PMID: 20516309 www.ncbi.nlm.nih.gov/pubmed/20516309. Lykissas MG, Jain VV, Nathan ST, et al. Mid- to long-term outcomes in adolescent idiopathic scoliosis after instrumented posterior spinal fusion: a meta-analysis. Spine. 2013;38(2):E113-E119. PMID: 23124268 www.ncbi.nlm.nih.gov/pubmed/23124268. Negrini S, Aulisa AG, Aulisa L, et al. 2011 SOSORT guidelines: orthopaedic and rehabilitation treatment of idiopathic scoliosis during growth. Scoliosis. 2012;7(1):3. PMID: 22264320 www.ncbi.nlm.nih.gov/pubmed/22264320. Negrini S, Minozzi S, Bettany-Saltikov J, et al. Braces for idiopathic scoliosis in adolescents. Cochrane Database Syst Rev. 2015;(6):CD006850. PMID: 26086959 www.ncbi.nlm.nih.gov/pubmed/26086959. Negrini S, Minozzi S, Bettany-Saltikov J, et al. Braces for idiopathic scoliosis in adolescents. Spine (Phila Pa 1976). 2010;35(13):1285-1293. PMID: 20461027 www.ncbi.nlm.nih.gov/pubmed/20461027. Sucato DJ. Management of severe spinal deformity: scoliosis and kyphosis. Spine. 2010;35(25):2186-2192. PMID: 21102292 www.ncbi.nlm.nih.gov/pubmed/21102292. Trobisch PD, Samdani A, Cahill P, Betz RR. Vertebral body stapling as an alternative in the treatment of idiopathic scoliosis. Oper Orthop Traumatol. 2011;23(3):227-231. PMID: 21674182 www.ncbi.nlm.nih.gov/pubmed/21674182. Warner WC, Sawyer JR. Scoliosis and kyphosis. In: Azar FM, Beaty JH, Canale ST, eds. Campbell's Operative Orthopaedics. 13th ed. Philadelphia, PA: Elsevier; 2017:chap 44. Weinstein S, Dolan L, Wright JG, Dobbs MB. Effects of bracing in adolescents with idiopathic scoliosis. N Engl J Med. 2013;369(16):1512-1521. PMID: 24047455 www.ncbi.nlm.nih.gov/pubmed/24047455. Yang S, Andras LM, Redding GJ, Skaggs DL. Early-onset scoliosis: a review of history, current treatment, and future directions. Pediatrics. 2016;137(1). PMID: 26644484 www.ncbi.nlm.nih.gov/pubmed/26644484. Reviewed By: Andrew W. Piasecki, MD, Camden Bone and Joint, LLC, Orthopaedic Surgery/Sports Medicine, Camden, SC. Review provided by VeriMed Healthcare Network. Also reviewed by David Zieve, MD, MHA, Medical Director, Brenda Conaway, Editorial Director, and the A.D.A.M. Editorial team.